Exposure: 6 x 480 sec H-Alpha (1x1), 6 x 180 sec Luminance (1x1) with IR/UV Block, 8 x 60 sec RGB Exposures (2x2). Processing: Images were captured with Artemis Capture (as FITs). Aligned/stacked in Registax 3 and saved as FITS. Luminance, H-Alpha, and Color channels were scaled and rough color balanced in Astroart. Channels were co-registered in Astroart. In Photoshop, the H-Alpha exposure was the main exposure for the luminance construction - the 120 sec Luminance was used for star field depth and detail and to capture full visible bandwidth not captured in the HA exposures. Curves and Levels were applied in Photoshop to optimize object appearance. Final LRGB combine was done in Photoshop using Luminance Layering (or LLRGB). Noise Ninja was used to smooth background noise. Color balancing and final touches were done in Photoshop. Selective layer sharpening was performed on prominent nebula features. Final Image size is approximately 1392x1040. All exposures in this image were guided; North is to the left in this image. 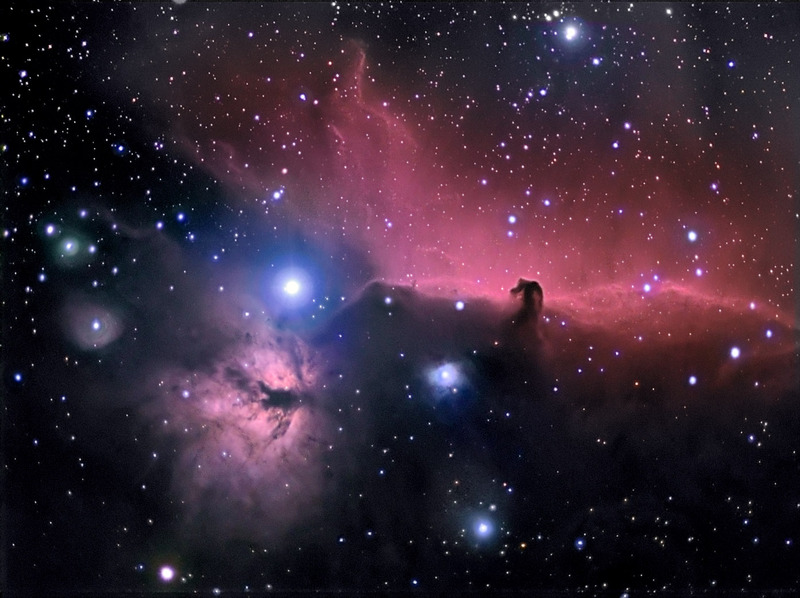 Dark nebula B33 ( with the surrounding emission nebula IC 434 outlining it) is popularly known as the Horsehead Nebula. The object in the lower left is NGC 2024 - popularly known as the Flame nebula. The bright star is Zeta Orionis also known as Alnitak - the Left most star in Orion's belt. This image replaces an earlier image in the Archives here. The Horizontal FOV is 102'. Image center is located approximately - Equatorial 2000: RA: 05h 41m 02s Dec: -02°18'19"